Chorus Voices Ep 28: Loneliness Part 1: What is loneliness? According to Swinburne University almost 28% of Australians feel lonely at least three days every week. And 1/5 of us rarely feel we have someone to turn to for help. 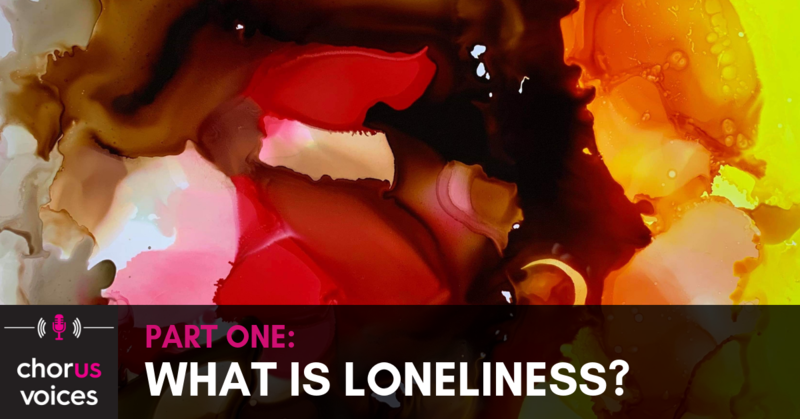 We wanted to find out more about being lonely – how our personalities, where we live, the way we are brought up and what happens along our life journey can contribute to loneliness. In Part One, Lou Forster speaks to three people about their experience of loneliness. Warren lives in WA, is 53, has five children and separated from his wife three years ago. “You realise that you’re using your phone… as a portal to avoid isolation,” says Warren. Duc lives in inner city Perth, WA. She’s an academic and came to Australia from Vietnam when she was 18 months old. “There’s a difference between being alone and being lonely. Sometimes respite from the world is a good thing,” says Duc. Brett also lives in Perth. His life changed when he was bitten by a tick on a trip of a lifetime to the Amazon. Lou also talks to psychologist Abby about what happens to our minds and bodies when we experience loneliness. Abby offers some tips on how to combat feelings of loneliness. Tune in next week for part two of our three-part series on loneliness when Chorus Voices looks at why we feel lonely and who is particularly at risk.